Concrete driveway cost calculator - what does it do? 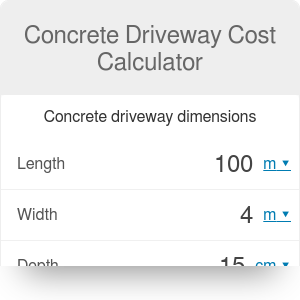 Concrete driveway cost calculator is a smart tool that provides you estimations of costs and amounts of materials needed to build a concrete driveway. For all these things: gravel, rebars, wooden forms and concrete, you need to know the exact quantities and finally the sum of material costs. It might be overwhelming and time-consuming to make all necessary calculations by hand. There is a much simpler and quicker solution - use the concrete driveway calculator and find your concrete driveway cost. These road types differ in terms of costs, durability, and complexity of building it. The concrete driveway is a reasonable choice. Why is it so? Because that type is durable, good-looking, long-lasting and maintenance-free. The combined strength and longevity make concrete a relatively good value for large areas of paving. As a driveway surface, concrete is more expensive than gravel and asphalt. However, it is considerably less costly than brick or cobblestone ones. Simple mode - in the beginning, enter only 3 parameters that are required: length, width and depth of a planned driveway. All other calculations like e.g. materials costs are computed based on its default values. Advanced mode - in addition to simple mode, you can set detail driveway parameters like depth of gravel, spacing between rebars, rebars spacing from the driveway edges and the length of simple rebar piece that will be used. What is more, you can set detail buying prices (in your local currency) for all the materials. That will be the base for total concrete driveway cost. Take a look at the step-by-step calculation example below. We want to make sure that you are using our calculator in the right way. We need to make some of the assumptions about road dimensions and material prices, so the numbers below are only for example purposes. Click the Advanced mode button to activate detail parameters. Now, material estimations and material costs fields appear. single rebar length = 6m - the length of a single rebar piece that you buy from a supplier. Fill in your supplier's prices of building materials: concrete = €90/m³, gravel = €15/m³, rebar = €2/m, form = €0.8/m. formula for concrete: total concrete volume = length*width*depth. Our example calculation gives 60m³ of total concrete volume. formula for gravel: total gravel volume = length*width*gravel_depth. In our case it equals to 32m³. rebar_rows = ((length-(2*edge_rebar_spacing))/rebar_rebar_spacing)*(width-2*edge_rebar_spacing)) - for rebar columns, the calculations are analogous. The result for our data is 2556 m.
rebar pieces = total_rebars_length/single_rebar_length. That gives 426 units of rebar. total forms length = (2*length)+(2*width) And the length of our forms will be 208m. Finally, look at the total building costs: concrete cost = total_concrete_volume*concrete_price - other costs are calculated analogically. The gravel and forms cost €480 and €166.4 respectively - as you can see, their prices are low compared to the other materials you'll need. Concrete Driveway Cost Calculator can be embedded on your website to enrich the content you wrote and make it easier for your visitors to understand your message.